Last night, the final presidential debate was held. Since we won’t be afforded any more opportunities to see the candidates go head to head on television like this, GOP nominee Donald Trump decided to really play up the performance angle. He mugged for the cameras, especially after his opponent, Hillary Clinton, mentioned his lack of Emmys for The Apprentice. He even managed to remember his blocking, and remained behind the podium. But Trump’s improvisation—he appeared to disagree with his running mate and spokespeople on what his concession would look like—failed to impress Stephen Colbert, who knows a thing or two about showmanship. The Late Show host criticized Trump’s statement that he’ll make America wait to see whether or not he’ll accept (we can forget about “gracefully”) the results of the election in the event of a loss. After all, a “democracy cliffhanger” isn’t really suited to the welfare of an entire country, especially not one that’s already so divided over the election. 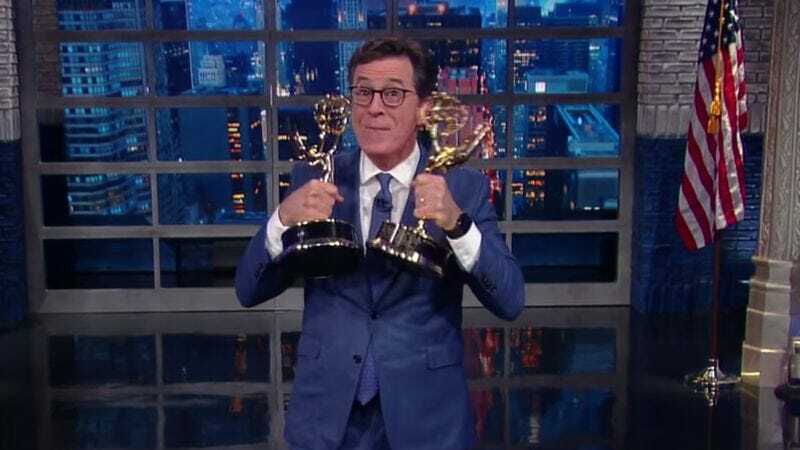 And, as Colbert notes, it’s not even the kind of stunt that will win you an Emmy.